John Killacky was at the Greater Burlington YMCA on Monday morning when he overheard two men in the locker room talking about him. One was arguing that Killacky shouldn’t have agreed to rent the Flynn Center for the Performing Arts to Republican presidential candidate Donald Trump's campaign for a rally Thursday night. The other defended Killacky’s argument that the Flynn stands for free speech. It’s been a whirlwind few days for Killacky, and for Vermonters, since the New Year’s Eve announcement that the Flynn will host the bombastic Trump. The controversial candidate has rented the hall and its 1,000 seats (sans balcony) for $3,300, plus personnel expenses. In email exchanges, on Facebook feeds and via phone calls, Trump opponents around Vermont are in a fury over how to respond to a candidate who has called for banning all Muslim immigrants and regularly disses just about everybody. Should they boycott the Flynn? Show up and silently turn their backs on Trump? Or holler like hell that his kind of "hate" has no place? Vermont activists are considering those options and more. At least four Burlington-area events are planned, from silent vigils to rowdy rallies and even a comedy show — all in an attempt to trump Trump. Already, the candidate who thrives on controversy has created plenty. The Vermont Workers’ Center, a liberal advocacy organization, launched a petition calling on the Flynn to turn Trump away — only to change tactics Monday morning in the face of furious opposition from those declaring that free speech applies to all. Haslam's group is planning a Rally for Love and Unity at 6 p.m. Thursday, across the street from the Flynn in City Hall Park. But he also said a reaction of any kind is exactly what Trump seeks. “He’s obviously looking for a fight. He wants to look like he’s brave coming into the lion’s den, Bernie’s hometown,” Haslam said. Indeed, Trump will be speaking just a block from the campaign office of Sen. Bernie Sanders (I-Vt.), whose candidacy for the Democratic presidential nomination is every bit as surprisingly successful as Trump’s. Sanders has in recent weeks condemned Trump as a liar, but don't expect him to engage Trump in a head-to-head showdown. Sanders will be campaigning in Iowa while Trump is in Burlington. He has no plans for any kind of counter rally, Sanders spokesman Michael Briggs said. In a written statement Friday, Sanders welcomed Trump to town and said, “I hope his presence here will help him better understand Vermont values — social and economic justice, tolerance, respect for all people and the environment." Trump is unlikely to be persuaded by anything he sees or hears in Vermont, said Stuart Stevens, a Washington, D.C.-based political strategist and Middlebury College graduate who worked on Mitt Romney’s Republican presidential campaign. Stevens predicted Trump will win no states and will limp off the presidential campaign trail in short order once the voting starts in February. 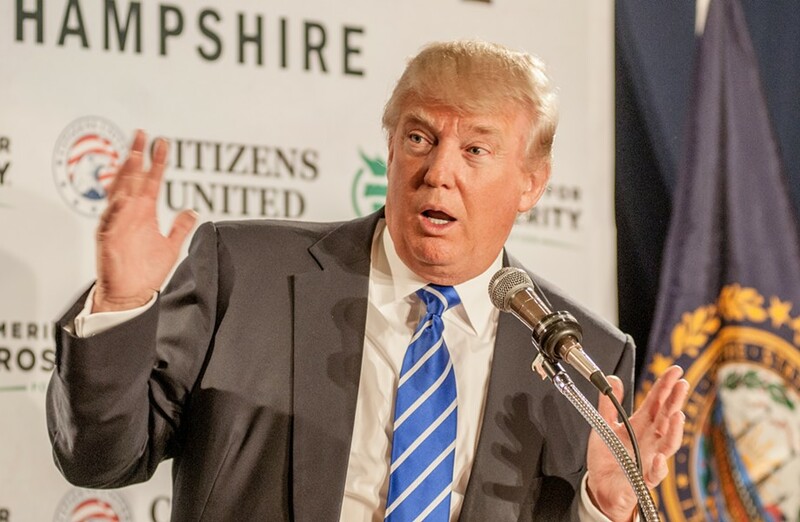 Trump will likely steal the thunder of another Vermont politician. His 7 p.m. rally will come just hours after Democratic Gov. Peter Shumlin delivers his final State of the State address in Montpelier. On the plus side for Shumlin: Many of the same protesters who interrupted his inaugural address a year ago will be busy in Burlington, waiting for Trump. Trump’s campaign did not return a call seeking comment about his trip. If he’s hoping to nail down the Vermont Republican primary on March 1, he has shown little interest in building a campaign presence here. Vermont is not among the states listed on Trump’s website as having an established organization. Regardless, he’s likely to draw a crowd of supporters and opponents. After initially saying the free Flynn tickets had run out quickly, the ticketing website Eventbrite appears to be allowing as many people who want to sign up for at least two tickets at a time. However many people end up with tickets, only 1,000 will get in, Killacky said. They’ll pass through Secret Service security that will not allow signs or anything that passengers aren’t allowed to carry on a plane, he said. Doors open at 5 p.m., or possibly earlier at the discretion of the Secret Service, he said. Killacky knew that Trump’s visit would be big news, but the hoopla has been far greater than he anticipated. “I don’t think I would have chosen it,” he said. Still, he contended that the debate is healthy. “Let’s hope after the candidate leaves, our community is talking to each other in a different way,” he said. “I might go down there and have a laugh," Killacky said.